Updated Sunday April 21, 2019 by BYB. 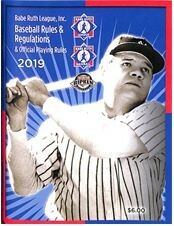 Official Babe Ruth League Baseball Rules and Regulations & Official Playing Rules and any additional BYB Board approved League/Park Rules will regulate play. There will be absolutely NO special rules agreed upon between the coaches.